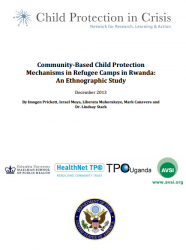 The purpose of this research is to learn about community-based child protection processes and mechanisms (CBCPMs) in two refugee camps in Rwanda – Gihembe and Kiziba. In particular, the research seeks to identify what refugees see as the main harms or risks to children, what CBCPMs exist and how they are used, what protective factors enable children’s positive coping and resilience, and whether and how the CBCPMs link with elements of the formal aspects of the child protection system, led by the Rwandan government and Office of the United Nations High Commissioner for Refugees (UNHCR). This study places special emphasis on the linkages between CBCPMs and education-sector groups and structures in order to assess modalities of interaction and collaboration between the two sectors for the strengthening of children’s protective environment.